Universal officially announce " The Wizarding world of Harry Potter " land at Islands of Adventure ! That's it! Universal Studios officially announced today the opening in late 2009 of the awaited Harry Potter land at Orlando's Islands of adventure ! And here are the three renderings released by Universal showing this future land. 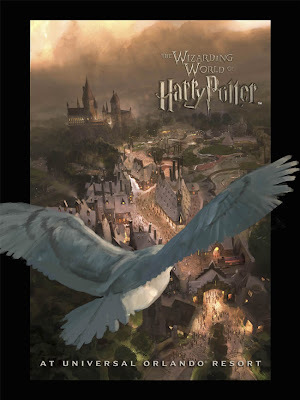 Universal and Warner Studios are partnering to "create the world’s first fully immersive Harry Potter themed environment envisioned as a theme park within a theme park, based on the best-selling books by J.K. Rowling"
Guests will be able to visit some of the most iconic locations found in the books and the films including the village of Hogsmeade, the mysterious Forbidden Forest, and Hogwarts castle itself. "The plans I've seen look incredibly exciting, and I don't think fans of the books or films will be disappointed," said J.K. Rowling . The "Wizarding world of Harry Potter" as the project is called will include immersive rides and interactive attractions, as well as experiential shops and restaurants that will enable guests to sample fare from the wizarding world’s best known establishments. Universal said " we're planning a collection of rides and attractions specifically designed to bring the magic and adventures of Harry Potter to life in an exciting way that guests have never experienced before. That will include a new state-of-the-art attraction"
Stuart Craig , Potter's Movies production designer will collaborate with Universal creative's team in designing the park and J.K.Rowling hopes this will provide fans with another way to experience the world beyond the books and films. 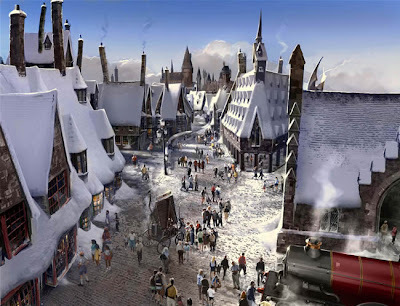 The "Wizarding world of Harry Potter" fully immersive experience will be located at Islands of adventure, a portion of what is currently the Lost Continent will be devoted to the new environment, as well as an undeveloped area that is currently not in use. The new environment will be comparable in size to other islands within Islands of Adventure and will open late 2009 or early 2010. An here is the best: although Universal didn't mention any budget for this new land , the cost is supposed to be of 1 BILLION dollars! The BIG question, now, is how is going to react Disney at this major announcement. This is where it becomes interesting, as this billion dollars Harry Potter land will be a major danger for WDW when it will open in 2009. No doubt that everybody coming to Orlando will rush to IOA to see it. So, my feeling is that we can expect in a while some major announcement from WDW. Hmmm...what about a "Narnia" land in Animal Kingdom where WDI was supposed to built the Beastly-kingdom-that- never-was? Or a real - at last - Star Wars land? "Universal plans a 20-acre "Wizarding World," a little bigger than the average size of its themed "islands" at Islands of Adventure. Part would be carved away from what is now "The Lost Continent" island, and the rest would be land now used for employee parking and park support, outside the back fence. The new, "seventh island" would feature reconstructed and rethemed attractions, and all-new ones, Scott Trowbridge, vice president of Universal's Creative Studios, said in an interview. 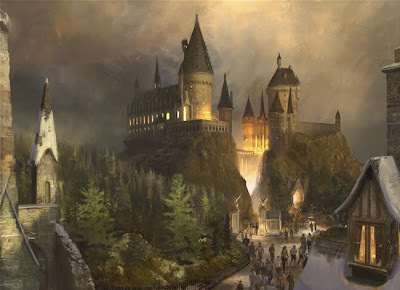 The Hogwarts castle and locations from Rowling's Forbidden Forest and Hogsmeade village will be created as backdrops to attractions, shops and restaurants. Three-time Academy Award-winning production designer Stuart Craig, who designed sets for all the Harry Potter movies, leads the "Wizarding World" design team. Much of "The Lost Continent" island, including Universal's award-winning Mythos Restaurant, will be retained as a separate themed area, just smaller. The island is to remain open during construction as well. Some current "Lost Continent" attractions such as The Dueling Dragons roller coasters and The Flying Unicorn coaster ride likely would be adapted to fit the Harry Potter story. Trowbridge would not discuss specific attractions, but did say that Universal intended to "leverage some existing infrastructure." He said that would have to include far more than a new paint job and a new sign, because too much is at stake. "We do have a responsibility to all the fans that are out there in the world that have followed the Harry Potter saga through the films and the books," Davis said. "We're taking that very, very seriously. We're going to be true to the books and the films, and make sure that when people come here they're going to be very, very happy with what they see."